I did a little self-promotion last fall. Not my usual plead to read my blog on via social media. I took a flier I made to Cincinnati’s Books by the Banks, hoping to intrigue some writers and get them to be blog guests. It worked. I reconnected with Brandon T. Snider, now a fabulous author and actor. I also heard from Cincinnati author and editor Diane Stortz – how lovely is that? Author of several adult and kid books, her writing centers on her faith. How long have you been writing children’s books? When I was working as a children’s book editor in-house, I sometimes wrote a picture book or board book to fill out a line. I started trying to publish on my own after I began to freelance in 2006. A book for adults came first, and then The Sweetest Story Bible was published in 2010. Can you tell me a little bit about your writing process? I try to stay well aware of the marketplace and not duplicate what other authors are creating. I want to offer books that parents recognize as a great value and children want to return to again and again. Finding just the right words can be difficult—sometimes I write whatever comes to mind and then go back to seriously revise! Why did you decide to write about your faith? I love making the Bible accessible to children, helping them develop the perspective that it’s not primarily a book of rules but a revelation of who God is, what he does, and how much he loves and cares for them. What gives you joy about writing? Well-written words have a rhythm, a musicality, that I enjoy hearing and creating. And seeing the finished book and paging through it for the first time is always a joy! Your book Words to Dream On includes suggestions for bedtime and Words to Dream On. Can you tell me more about that? With every story there’s a short, related Bible verse—wonderful words for children to be thinking about as they drift off to sleep. The tips for bedtime at the back of the book come from experience and the advice of experts—things like establishing a consistent routine and sticking to it as much as possible, and ending noisy, energizing activities well ahead of time. Do you read your books to your grandchildren? Can you share some of their reactions? I do read to them, every chance I get! They think it’s exciting that they can find my books in bookstores. And when they really pay attention to a story, or talk about it later, that’s so encouraging to me! Diane’s grandchildren find her books at Barnes & Noble. Cool grandma! Can you share any favorite books that you read to your girls when they were growing up? Some that stand out are the Little Golden Books’ Forest Hotel and The Animals’ Christmas Eve, plus The Man Who Lost His Head, which my husband had enjoyed when he was a boy and searched for a copy to read to the girls. Could you share some words of encouragement to parents wanting to instill a love of reading in their children? Keep books accessible to children around the house. Start babies and toddlers with sturdy board books and expand the types of books as children grow—picture books, chapter books, Bible storybooks, nonfiction. Let children own some books, but use the public library too. Children enjoy choosing their own books from library shelves, and there’s no cost involved! Show that you value reading. Be a reader yourself. And read to children regularly, even when they begin to read independently. They value this time with you! Diane had a new book out I AM:40 Reasons to Trust God. What happened with Libby Hunter saw some local teens acting out from boredom? She and friend Elissa Yancey decided to find a solution and founded WordPlay, Cincinnati’s Creative Learning and Writing Center, a place for kids to be creative and succeed. Pippin Rush filmed Libby and I talking about WordPlay, how it’s changing young lives, and of course, books. Enjoy! Music courtesy of David Hunter. Special thanks to Pippin Rush, videographer. P.S. Max and Calvin have been to WordPlay and they loved it! Word Play-HD from julia mace on Vimeo. The artist, born in 1888 in West Chester, Pennsylvania, is known for his depictions of the African-American experience. 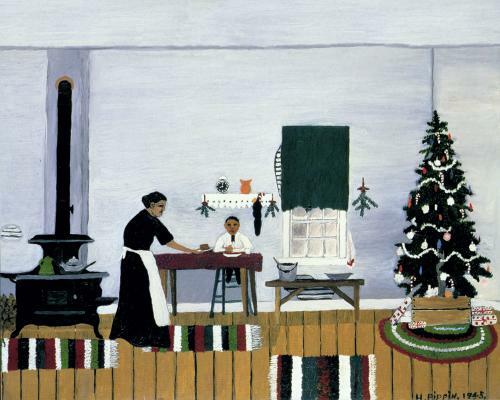 Horace Pippin’s painting, Christmas Morning Breakfast. You can see this 1945 work at the Cincinnati Art Museum. Don’t worry, I checked! The title caught my eye on the discount table of a local bookstore. 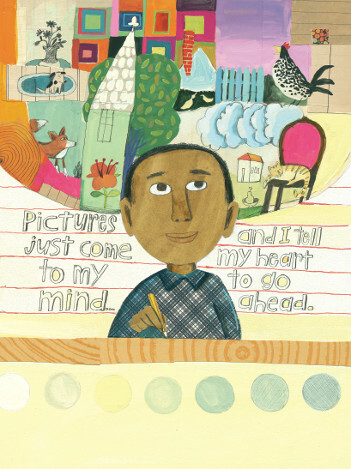 Worth every penny and more, Melissa’s Sweet’s illustrations heighten the great story. Her work is delightful. Max and Calvin took to the story right away. Pictures just came to Horace’s mind. The book chronicles Horace’s life up until his artistic success. As a child living in poverty, he draws constantly. A lack of money means no supplies but he uses scraps of paper and charcoal. But the enterprising Horace enters an art contest and wins his first box of colored pencils, brushes, and paints. “Let’s read the book about the guy who holds his hand to draw, “ Max will say. Horace overcame his injury and continued to paint. Horace found success and created many works that hang today in museums around the country. It’s an inspiring story of how he overcame many obstacles – racism, injury, poverty – to become a respected artist. My husband (who had the same misconception about Horace’s origins) and I visited the Cincinnati Art Museum recently with our boys. I’ve looked forward to showing them one of his paintings and having some type of deep moment. We ran out of time and didn’t find it. But we will go back and I’ll be sure to point out the splash of red. 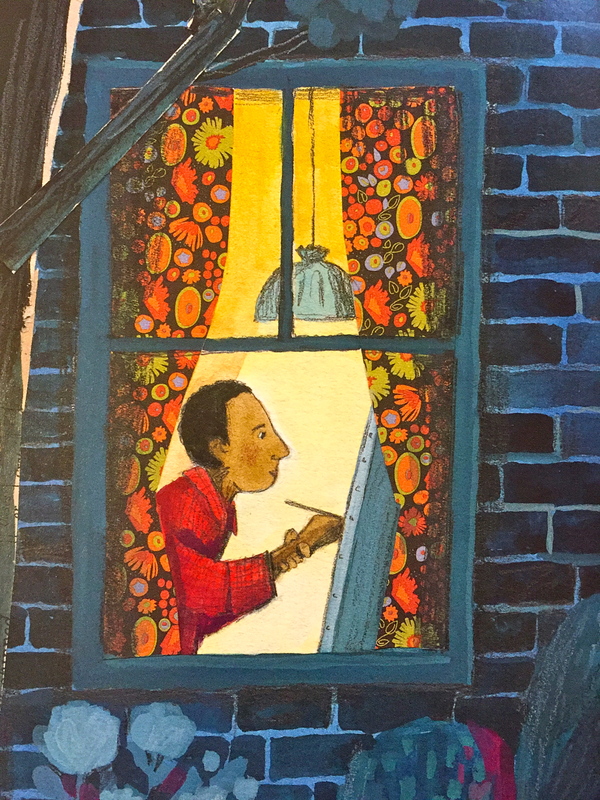 The author and illustrator researched this book together; unusual in the book process. In the back of the book, they share their journey, including a visit to Pippin’s grave. Where they saw a red cardinal in the gray winter landscape. Here’s a great reading and craft guide to use with the book.